It's time to trip out with your tablet. 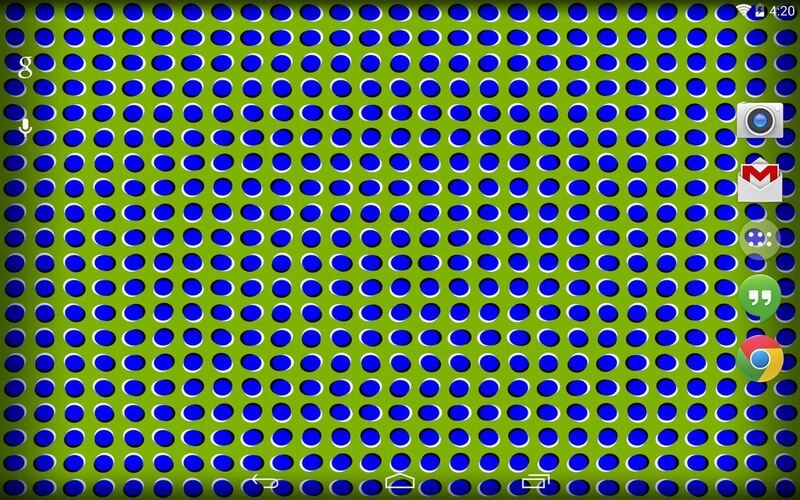 If you're not looking to drain that precious battery life with a fancy-looking live wallpaper, then apply an optical illusion that appears to be moving on your Nexus 7 (or any other Android device) instead. 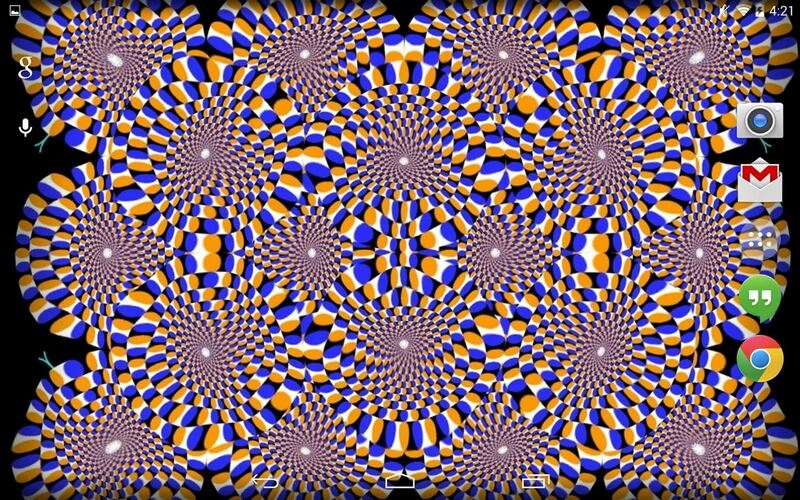 Many of these visual illusions are referred to as motion illusions, in which static or still images appear to move due to the interaction of contrasting colors and shape positions. Your brain will attempt to make sense of all the chaos and find a simple pattern, creating the illusion of movement. Before you continue, I must warn you that some of these wallpapers I'm about to show you will make your eyes hurt and could produce nauseating effects. 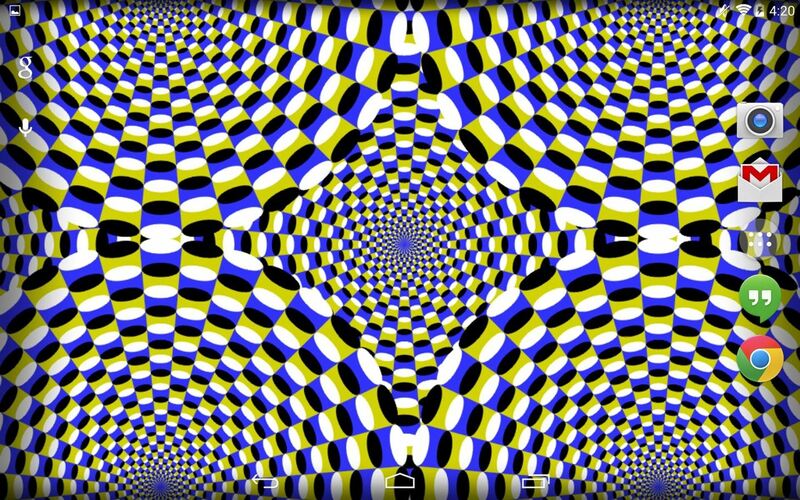 Basically, try not to stare too much or you'll get a headache and possibly throw up while looking at these patterns. As many of us with Nexus 7 tablets already know, grabbing an image off the web for your wallpaper is perfectly fine, until you switch to landscape mode and the image gets cut off. To prevent this from happening, apply wallpapers using Simple Image Wallpaper, free on Google Play. 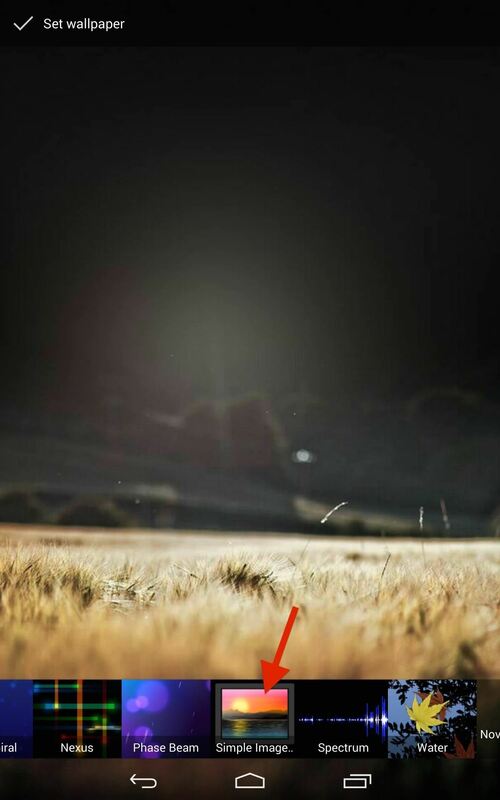 After settling on one of the images below (or any image), hold down your home screen and access your wallpapers. Locate Simple Image Wallpaper and enter the settings. Pick the image you want to load from your gallery. 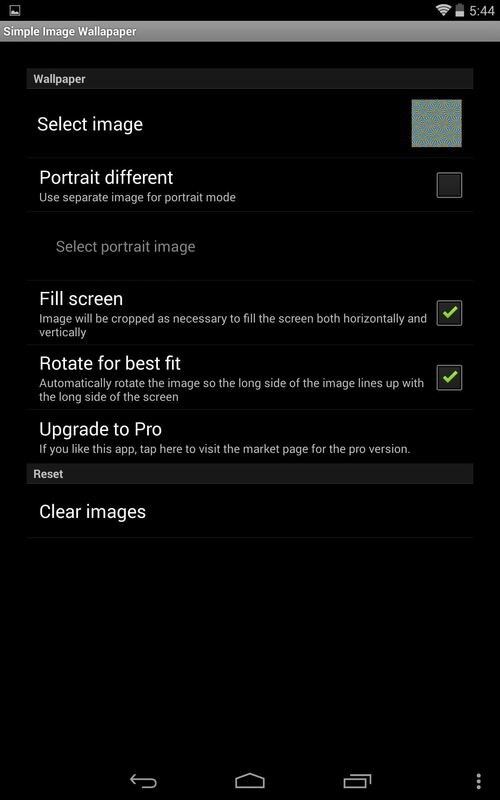 In some cases, you may have to enable Fill screen and/or Rotate for best fit in order for the image to properly apply in landscape mode. Now, let's get on with the sickening wallpapers! #1: Feel Like You're Rollin'? If you notice, this effect should make it seem like three cylinder shapes are rolling next to one another. Maybe the yellow and blue are a bit of an eyesore—unless you're a Michigan or UCLA fan—but it's still pretty amusing. I like this one a lot, until I stare at it long enough to want to throw up. This is what I imagine people see right before passing out. 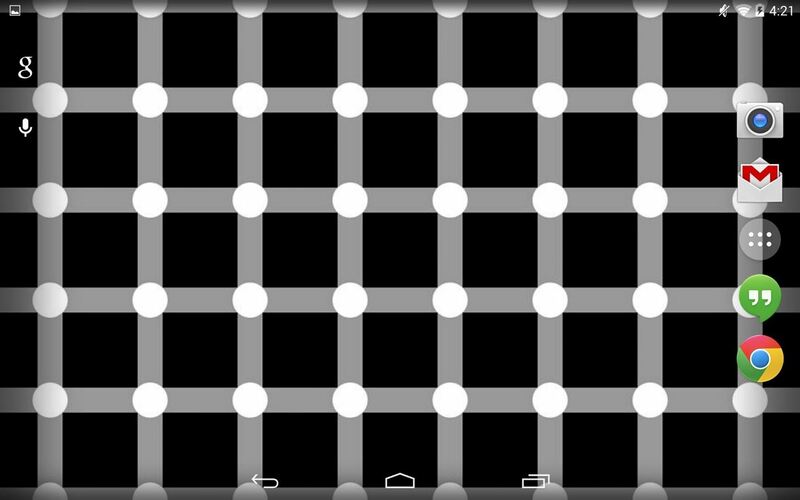 You should feel like you're seeing black dots all around, but keep in mind, there are no black dots anywhere—or are there? 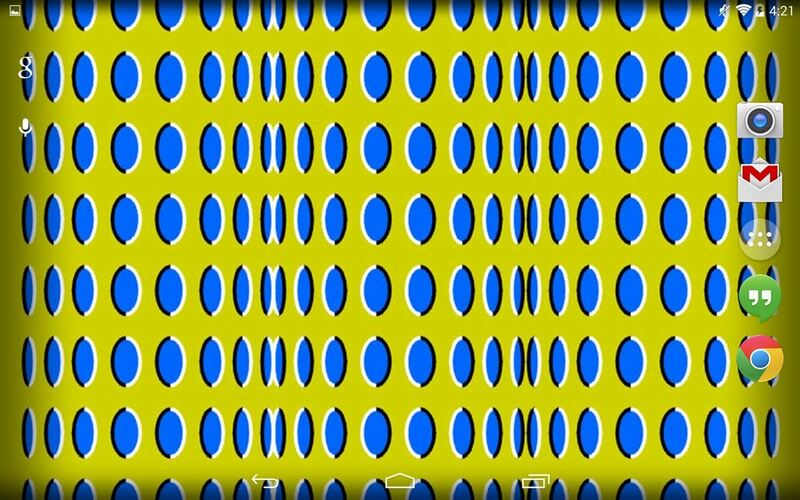 This unique pattern should make your wallpaper feel like it is always in motion. Focusing your eyes on different areas will make it seem like there is a wave effect going on. As your eyes attempt to make sense of this pattern, it will give you the illusion that the shapes and colors are expanding. Make sure you're not on any hallucinogens while viewing this, or your face may just melt off. This may remind your parents of their hippie days, or maybe just give them a headache. All I can see when staring at this is a bunch of circles rotating like cogs in some great big mechanism. A metaphor for life? Yeah, maybe. The primary way, which is obvious, is a Google search for keywords like optical illusion wallpaper, motion illusion wallpaper, or some variation of that. Make sure to restrict your search to large scaled images—anything sized 700 x 400 or lower can get pixelated and look horrible as your wallpaper, and the effect won't be as nauseating. Aside from the obvious Google search, there are countless websites that have free wallpapers, like Wallpoper and even the Smithsonian site got in on the fun. If you find any great ones of your own, show them off below in the comments section. No black circles / dots. The parallel lines r transparent / white.